EL SEGUNDO, Calif.--(BUSINESS WIRE)--Beyond Meat® announces another category first: its breakthrough plant-based burgers are heading abroad with plans for expanded distribution and availability across six continents this summer. 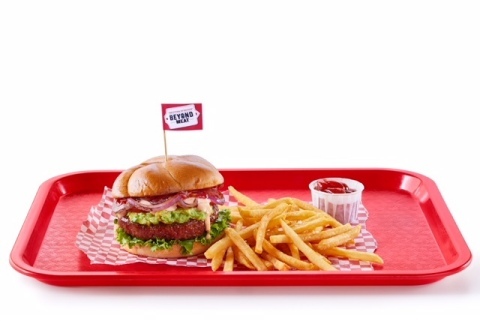 The mission driven company which aims to positively impact human health, the environment and animal welfare by replacing the protein at the center of the plate with plant-based meat, will work with leading distribution and food service partners globally to roll out The Beyond Burger® worldwide. In the coming months, Beyond Meat has partnered with a select group of distributors to enter over 50 countries including Germany and the rest of Europe, Canada, Australia, Mexico, Chile, Israel, UAE, Korea, Taiwan and South Africa. Since launching The Beyond Burger in 2016, Beyond Meat has sold more than 13 million of its protein-packed patties which can be found in nearly 15,000 restaurants and grocery stores across the U.S. The Beyond Burger is the world's only burger that looks, cooks, and tastes like ground beef from cows but is made entirely from plants, without GMOs, soy, or gluten. Crafted with simple plant-based ingredients, applied in fresh ways, The Beyond Burger has more protein than a beef burger, with less saturated and total fat. With a clearly defined mission, Beyond Meat’s world-class team of researchers and food scientists work together towards a singular goal: perfectly build a piece of meat from plants. An industry gamechanger, Beyond Meat created a cutting-edge process that organizes each of its plant-based ingredients to deliver against the unique texture of meat. By braiding together proteins, fats and minerals, Beyond Meat is able to re-create the basic architecture, and thus texture, of meat. Earlier this year, Beyond Meat announced the construction of its new research and innovation facility in Los Angeles. A seven-fold increase of the existing R&D footprint, the new state-of-the-art facility is projected to cut production scale-up timelines in half, enabling the company to bring a new product to market every year.